The memories of tasting a new soup can be as wonderful as the soup itself. And so it is with this particular soup. I don’t remember the year but I recall it was around Valentines Day when I was first treated to a taste of this simple soup. My friends Kathy and Litha had conspired to give twelve of their shared girlfriends the best sort of Valentine ever – an invitation to a luncheon, to share and bask in love from their kitchens and in the love of God herself. These women did all the cooking in advance. So guests arrived to be welcomed by the hostesses, to tables so prettily set, that we knew ourselves for the special company we were. We were seated and waited on, one course after another. The creamy red soup came first, served with dainty cheese wafers, all home-made. Then the sweet ending was some type of raspberry and chocolate confection that was almost too pretty to eat. And I don’t recall what came in between, nor do I remember what was said by any one at the table, though I recall that later we circled up in Litha’s living room to share our favorite biblical passage about God’s love. But I’ll never forget how it felt to have a seat at the table amidst such fine company. I felt that this is how the world should be…everyday, not just on special occasions. I felt love all around me. And the love made me feel infinitely precious. And how rare this feeling is, that I should still be warmed by the memory of that day, seven or eight years later. That this should be so tells me that we don’t love each other nearly as well as we could, even those in our closest knit circle of friends and family, forgetting for a moment the poor, the hungry, the homeless, the lonely, the grieving that are strangers in our midst that so desperately need a sign of our love and God’s. Our knowledge of love grows out of a place of belonging, a place where we feel at home, a place where we are loved and accepted no matter what. And it hits me hard that I could do this more myself. And should do this more myself. And though I try to create a place of belonging within that monthly contemplative prayer class I facilitate, I wonder how the experience would differ if I were to host the group in my home, at least on occasion, instead of meeting at the church. It’s food for thought. And in the meantime, I think I’ll carry Kathy’s soup to next Thursday’s pot-luck supper. Maybe a taste of it will warm their hearts as much as mine… and maybe it will warm your heart too. From my life to yours. Simmer together in a large sauce pan over medium heat for 30 minutes. Adding basil, puree in small batches in blender or food process (note: small batches are important as hot liquid is very explosive when being processed or blended). Alternatively, use an immersion blender and leave the soup in the sauce pan as I do. Return to the sauce pan. Add remaining ingredients; heat through, careful not to boil. I reduced the fat content and changed the ingredient list for staples I keep on hand. 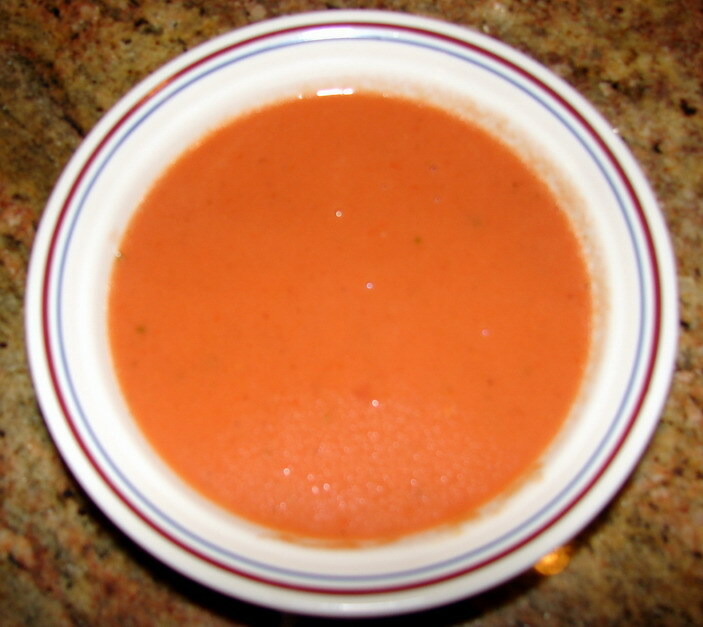 I love the tomato basil soup from La Madelaine – glad to see the revised recipe here. I just have to start making some changes in the diet – as much as I love butter, cream, sugar and caffeine, it’s time to go preventative rather than curative! I no longer remember how good the original recipe tasted — but the adapted one is very, very good. Still rich and creamy — and still easy too. Like you, I’m trying to watch fat intake. And cut down on sugar too. It’s hard to do either over the holidays, especially when one’s whipping up a batch of fudge… that yikes… it high on both fronts.